The fifth generation of SEI attendees from Kosovska Mitrovica and Gračanica, went on a study visit to Belgrade on the 6th and 7th of December 2018. The participants visited institutions significant to Serbia’s EU accession process, including the European Integration Committee at the National Assembly and the Ministry of European Integration of the Republic of Serbia. The second part of the visit was focused on exchanging good experiences, knowledge and practice with civil society representatives. During the study visit, SEI participants had the chance to talk to civil society representatives covering rule of law and sustainable development topics along with European integration. 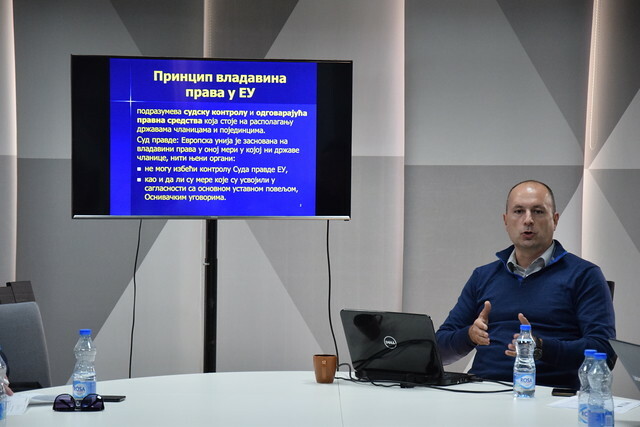 They spoke to Aleksandar Macura, founder of the RES Foundation about energy poverty in the Western Balkans, local energy management in Gračanica and other local communities including the potentials for utilization of sustainable resources. The rule of law group took a stop at BIRN Serbia where they talked with Maja Živanović, Predrag Urošević, Aleksandar Jovančić and Jovana Prusina about social processes monitoring and analysis. During the visit to the National Assembly they got acquainted with the role of the European Integration Committee, the Kosovo and Metohija Committee as well as the role of Parliament within the EU integration process. SEI participants spoke about key challenges and problems with Committee representatives. Later, the group had the chance to find out more about the Serbia accession process status and future steps at the Ministry for European Integration. They had the opportunity to talk about the major accomplishments, key challenges and future plans on the road to the EU. They emphasized that the process of Serbian accession to the EU was a strategic goal requiring much work in all areas to successfully complete reforms. The study visit was completed with an informal talk with civil society representatives, members of National Convention on the EU Working Group on Chapter 35, Marija Milenković from Inter, Verka Jovanović from Center for Ethnic Relations, Nikola Burazer from European Western Balkans and Marko Milosavljević from Youth Initiative for Human Rights. The Kosovo Foundation for Open Society, in cooperation with the European Movement in Serbia and the AKTIV NGO, started the School of European Integration in 2014 key stakeholders in north Kosovo*. In 2018, Communication for Social Development from Gračanica joined the project team which will contribute to the expansion of the School achieving better results in other local communities. Find more info on the project here.